Mobile home, 6 people, 4 room/s, 3 bedroom/s, 2 bathroom/s, approximately 38 m², 1 floor/s. Feature: Property in a holiday complex (220 units in total). Furnishing: modern, pleasant, friendly, linoleum floor. Equipment: TV; internet access Wi-Fi for 2 device(s) (payment); electric heating; air conditioning (in the living room). Final cleaning of the kitchenette by tenants. Holiday resort tax. Linen/towels must be brought along. Bed linen and towels available on loan, € 13.50 per person/​week (on order). Deposit € 300 (Visacard, Mastercard). Cot/​High chair each € 15 per stay (on order). Pet 2 animals allowed, € 30 per pet and stay (please advise prior to arrival). 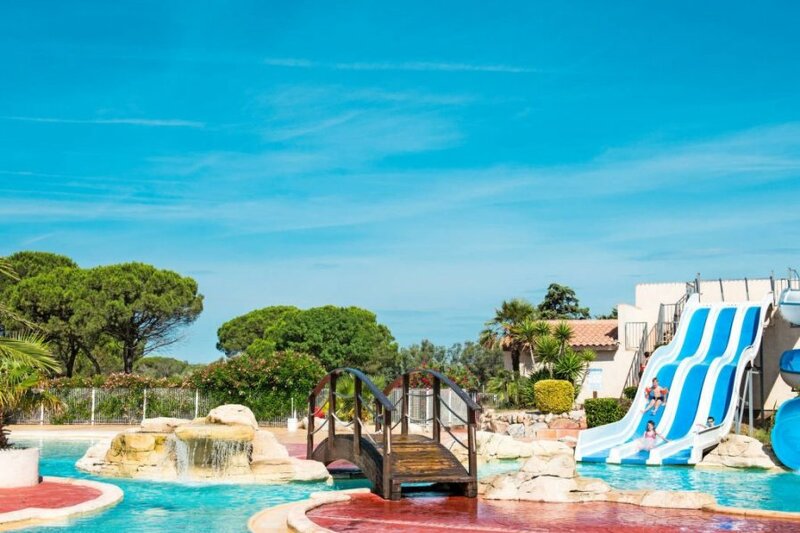 Situation: holiday village LES MURIERS, suburbian area Vendres-Plage. Access/parking: parking on the estate (payment). Estate (shared use with holiday guests): approximately 8 ha, closed plot (entrance gate). Pool (shared use): 700 m², open throughout the entire season, children's pool, slide. Pool area: tiled, artificial turf, deck chairs (depending on availability). Sports facilities/ leisure time: shared use (free of charge): multi-purpose sports track, bowling/boccia, table tennis table, children's playground (available during the whole season). Shared use (free of charge): beach volleyball (approximately middle of June until middle of September). Day care: included: children's club (approximately July/August). Bar/cafe, restaurant, food shop (approximately middle of June until middle of September). Plot description: private part of the estate approximately 150 m². 1 x parking on the estate. Terrace 10 m² (wood terrace), furnishing provided. The agent describes this apartment as an ideal holiday rental for the summer holidays. It is also good value for money. This apartment is located in Vendres. It is set in a very convenient location, just 0 metres away from a beach and only 3km away from the city center.